The Script Console is the place for running one-off ad hoc scripts, and for learning and experimenting with the Bitbucket API. Either enter your script directly in the browser, or click the File tab, and type the path to a file. The file can be a fully-qualified path name to a .groovy file accessible to the server. If you provide a relative path name the file is resolved relative to your script roots. 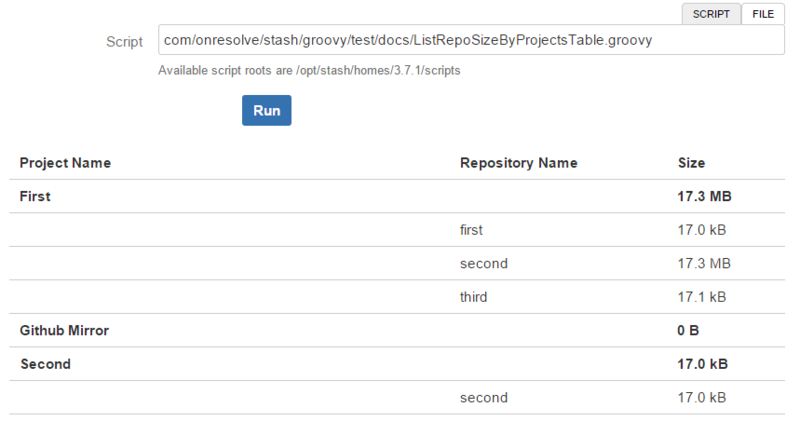 By default there is one script root automatically created, which is <stash_home>/scripts/. Read more about script roots and script plugins. Take one of these samples and use it as a starting point for your own needs. Let’s start with computing the sizes of all repositories, and summing them by project. We might wish to identify the projects that are using the most disk space on our Bitbucket instance. return "<pre>" + new JsonBuilder(sizeByProject).toPrettyString() + "</pre>"
return bytes + " B"
Manually enabling and configuring Bitbucket hooks across multiple repositories is a time-consuming and error-prone business. The following example enables and configures a hook across all the repositories in a project. In this case it enables the excellent Repository Mirror Plugin for Stash, which allows synchronisation to a remote repository, which could be on Bitbucket or GitHub for instance. This script assumes that for each repository in a Bitbucket project, there is a corresponding empty GitHub repository. It could easily be enhanced to create the remote repository if not present. def final String MIRROR_HOOK_KEY = "com.englishtown.bitbucket-hook-mirror:mirror-repository-hook"
Bitbucket won’t let you delete a project if there are any repositories in it. Deleting them one by one is painful. This script will delete all the repositories for any given project. Make sure you modify to include the correct project key. Be sure this is what you want to do, there is no undo button. See default project / repository permissions event handlers for a way to set default project / repository settings on creation. To use these snippets, add them to the code that iterates each project, immediately after the log.debug line, and before the closing }.